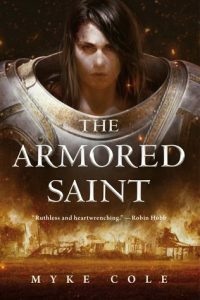 I borrowed a copy of The Armored Saint , by Myke Cole, from my local library. If I think about the fantasy YA storyline that I feel like I’ve read the most often, it would be the one where some teen, who is just a little smarter, or kinder, or more talented, or outspoken than everyone else somehow inadvertently challenges the overbearing authority of the land and then, in a desperate attempt to rescue the people they love, save the world. I swear I’ve read this story a hundred times and we find the exact same one here. So, this is not breaking new ground. But it does at least manage to place it all in an interesting world and the writing is good. My problem was mostly that almost every horrible thing that happened in the book happened because Heloise did something objectively stupid. Yes, they lived under a cruel regime. But that regime would have never noticed Heloise or her family if she hadn’t REPEATEDLY done stupid things to draw their attention. She seemed to have no impulse control at all and people died for it. But she still got to be the hero in the end. Meh. Lastly, I appreciate how loving and involved fathers were with their daughters, but I was left wondering why mothers and women in general were so left out (as usual). This is just one more fantasy world in which women only exist quietly in the background. This is always especially galling when the main character is a girl. This entry was posted in books/book review and tagged book review, fantasy, lesbian, magic on April 8, 2018 by Sadie.